In the last 10 years we have seen a significant rise in concrete or steel framed inners with masonry outers, and buildings where the inner and outer leaf are raised to different schedules. In response we present an exceptionally wide range of lintels designed specifically to assist these types of construction. As for all our lintels, each designation (eg. 'OL14') is available in a wide range of dimensions to suit different walls, but they have similar load capacity. 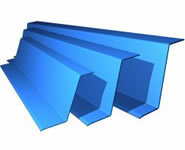 Simply follow the guidelines in the detailed PDF file to specify your exact lintel. 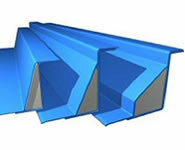 SEE ALSO SINGLE WALL LINTELS - they can be combined with these outer leaf lintels to support cavity walls! Traditionally known as 'timber frame' lintels, we've designed our OL lintels so they can be installed either with or without the clips to secure the top flange. This is our OL lintel but with the cavity closed. The hollow section is insulated and additionally makes the lintel much stiffer, for higher load capacity than the OL lintels. 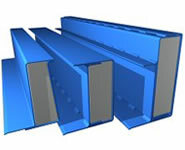 Shelf lintels to support an opening in the outer leaf by bearing into an inner concrete lintel or slab as well at the outer at the ends. 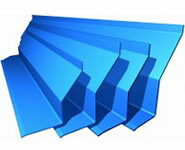 They are available in a very large range of drops, and to suit all standard cavities. This is the closed version of the OS Lintel, having the added benefit of extra stiffness and an insulated cavity closer. Again, they are available for all common cavities and a wide range of drops. OSH4/? Heavy Duty, any span! 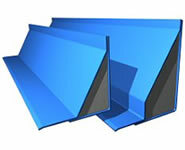 These heavy duty outer leaf lintels accomodate large spans in outer leaf masonry without being fastened to the inner frame or masonry. No other manufacturer offers anything like these - they are unique to our range!